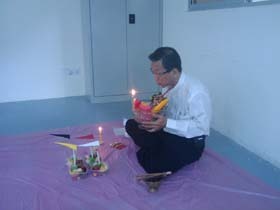 Master Sanna goes to on-site to clear any negative energies/entities in your residence or office. The whole process takes about 45 minutes to 1 hour. Occupants moving into a new house/office. Occupants who suspect negative energies/entities in residence/office. Protection of house/office from negative entities. Please click here to make an appointment and indicate your full name, site address and contact number. Kindly note that the above fee is for within Singapore only. Feel free to enquire regarding overseas engagement.